We offer roofing repair and a number of other roofing services to customers in and around Orillia, ON. There are a few signs that you might be in need of roofing repair. If you are up in the attic or upper level of your home and notice patches of light coming through the ceiling, you may have a crack or hole in the roof. You might also see water spots on the floors or ceilings, or dripping water in areas of the home. A leaky or damaged roof is cause for concern because it can lead to serious water damage and mold growth in your home. At Slippery Slope Roofing, we offer roofing repair and a number of other roofing services to customers in and around Orillia, Ontario. When you are looking for a company to provide roofing repair at your residential or commercial property, it is important to choose one that will produce good results in an efficient timeframe. Some companies promise low rates, but will surprise you with an unexpected higher bill after the job is complete. Others skimp on insurance or lower-quality materials for cheaper prices, but customers end up suffering the consequences of these choices. 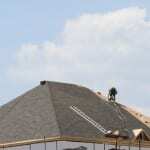 When you choose Slippery Slope Roofing, you can feel confident in knowing that our foreman and owner have 50 years of combined experience in the industry. Our team members are available for extended hours on weekdays and by appointment on weekends to accommodate your schedule. We also keep our job sites clean and orderly and will concentrate on your roof instead of taking on multiple jobs at the same time and getting stretched too thin.